HBO's first promo art for the sixth season of "Game of Thrones" is driving fans wild online. HBO released the first promo art for the upcoming sixth season of "Game of Thrones" on Monday, causing fans to buzz because it features Jon Snow. 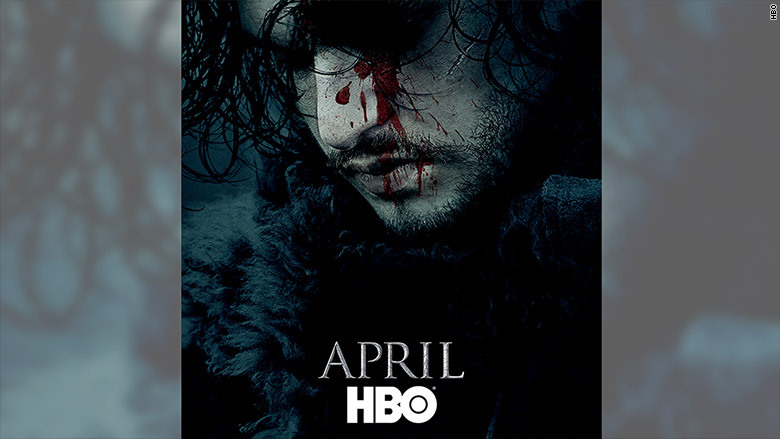 The teaser poster shows Snow, played by Kit Harington, looking down, eyes closed, with blood streaking down his face along with the words "April" and "HBO" below him. The show returns in April. For many fans, the image is confirmation that the Lord Commander of the Night's Watch is alive although maybe not well. The drama series, which broadcasts on CNN's corporate sister channel HBO, ended its season five finale with Snow lying in his own blood after being stabbed apparently to death by his own men. "'Dead is dead.' Or not," tweeted Debra Birnbaum, the executive TV editor for Variety. HBO's "Game of Thrones," which won the Emmy for Outstanding Drama Series at this year's Primetime Emmys, will return in April.